My grandma is a dessert maker. I've already extolled the greatness of her pies but she doesn't shy away from other desserts. When I don't have time to make my brownies from scratch, I do rely on the old box of brownie mix. As grandma says, why make brownies from scratch when you can just buy a box for 97 cents? The woman's got a point. 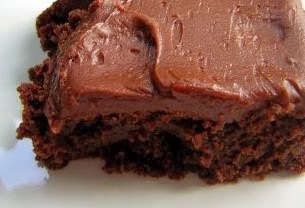 So to make your boxed brownie mix all the better, add a final touch of homemade frosting. Trust me, it'll promote those brownies to homemade status in no time. And the best part? This icing takes 5 minutes to make. Melt the butter in a small saucepan. Add milk, vanilla and sugar. Bring to a boil for 1 minute (Grandma says just count to 50). Remove from heat and stir in the chocolate chips. Allow to cool for a bit - it will start to thicken slightly. Then pour over a pan of brownies. Allow the frosting to cool completely. Try to not lick the bowl… I dare you.